Two Clinton LumberKings pitchers, right-handers Daniel Missaki and Ramire Cleto, underwent Tommy John surgery in Seattle today, the Mariners announced. Missaki made six starts for the LumberKings, going 1-2 with a 3.41 ERA, 34 strikeouts and five walks in 34.1 IP. He pitched seven innings of a nine-inning no-hitter against the Cedar Rapids Kernels on May 1, and was named the Midwest League pitcher of the week a few days later. He last pitched on May 6. Cleto, a relief pitcher, made three appearances for Clinton, posting a 3.52 ERA with five strikeouts and three walks in 7.2 IP. He last pitched on April 18. Charlotte Stone Crabs infielder Andrew Velazquez underwent surgery to repair a fractured right hamate bone on Tuesday and will likely be sidelined four to eight weeks. Velazquez, 20, hadn’t played in a game since Thursday due to what manager Michael Johns called a “nagging” wrist injury. He was batting .279 with 3 RBI through 17 games, having also missed eight days earlier in the season with a left shoulder strain. The Stone Crabs optioned Velazquez to extended spring training in lieu of placing him on the disabled list. Infielder Alexander Simon, who was with the team but not on the active roster, was added to replace Velazquez, who will likely return to action sometime in July. The Tampa Bay Rays acquired Velazquez in the offseason trade that sent pitcher Jeremy Hellickson to the Arizona Diamondbacks. He is ranked as the organization’s No. 12 prospect, according to Baseball America. Velazquez spent the 2013 and 2014 seasons with the South Bend Silver Hawks. In 2013 he batted .260 with 0 HR, 16 RBI and 7 SB in 65 games. In 2014 he batted .290 with 9 HR, 56 RBI and 50 SB in 134 games, and made headlines nationally for setting a new minor-league record for consecutive games reaching base (74). St. Louis Cardinals prospect Alex Reyes struck out 11 more batters Monday as he continues to dominate batters in the Florida State League. He has a 1.95 ERA with 52 strikeouts and 15 walks in 32.1 IP for the Palm Beach Cardinals this season. 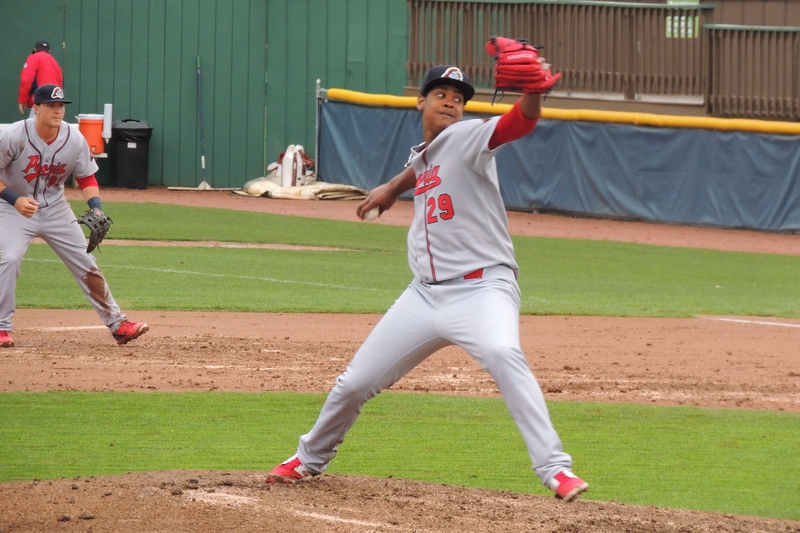 Reyes pitched for the Peoria Chiefs in 2014, going 7-7 with a 3.62 ERA, 137 strikeouts and 61 walks in 109.1 IP (21 starts). This entry was posted in Charlotte Stone Crabs, Clinton LumberKings, Florida State League, Midwest League, Palm Beach Cardinals, Peoria Chiefs, South Bend Silver Hawks. Bookmark the permalink.